Duncan Brookes, a BSAR member for over 42 years, was awarded the Emergency Service Medal on Queens Birthday, 8 June 2015.
to 2016 BSAR Strategic Plan and is following up with implementation of several initiatives arising from it including membership management improvements; safety clothing; and creating and improving operational policies. Mr Brookes has participated in over 34 searches and has provided outstanding service to BSAR as a Field Organiser on 19 of these. 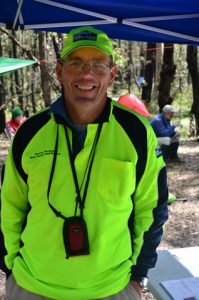 Bush Search and Rescue congratulates Duncan for being awarded the Emergency Services Medal in recognition of outstanding service to BSAR and the Victorian community. I also personally thank Duncan for his ongoing volunteer search and rescue work with us.